The November 28, 2017, ICBM missile test by North Korea of a Hwasong-15 missile, the first test of this missile, was a development which forced the world, the United States particularly, to be placed on notice that Kim Jong-un just entered near parity with all other nations in launch capabilities. The missile reached an altitude of around 4475 km (2780 miles) and traveled some 950 km downrange with a flight time of almost one hour. 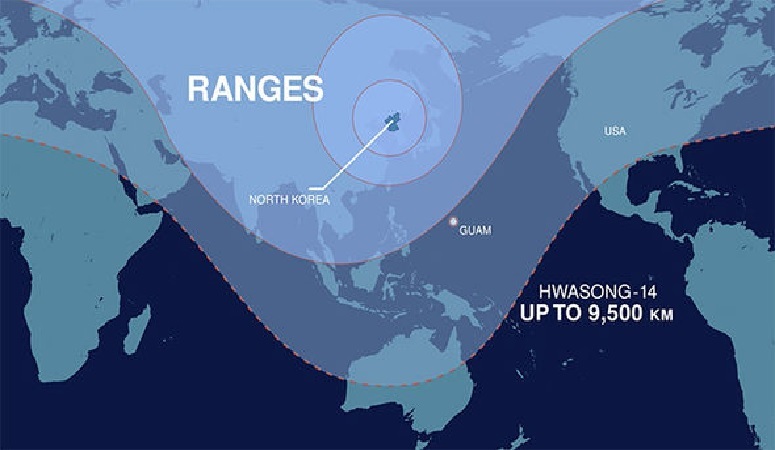 If fired on a more traditional attack trajectory, then the Hwasong-15 would easily be able to reach anywhere in the United States and the world (see map below for ranges of previous tests including the Hwasong-14 ICBM). This latest missile is considered to be capable of carrying a nuclear warhead. Whether North Korea has the technology to produce a tactically usable warhead has been debated by Pentagon and CIA personnel. The two questions which would require North Korea to be capable of making a tactically usable weapon come down to miniaturization of an actual weapon to sufficiently small size and weight, and survivability of reentry while retaining all capabilities. Most estimates grant the miniaturization part of the process, though some still have their doubts, but the jury is still out over the survivability part of the equation. We believe that North Korea has likely solved all of these problems and had done so even before Kim Jong-un came to power and he simply lacked the missile for delivery of the package. Now he has all the elements necessary making production and distribution of the missiles and warheads is all Kim Jong-un requires to have the ability to threaten the world whenever he chooses. President Trump made a statement on the economy and tax cuts but began the media meeting with a short mention of the North Korean missile test in the video below. The remainder of his talk he stressed that the Democrat leaders of the House of Representatives, Nancy Pelosi, and the Senate, Chuck Schumer, were absent from the meeting to which they were invited for a discussion with the President and their Republican counterparts. The President noted that the Democrats and Republicans are far apart in their ideas for the country and the direction it should be required to move. The main differences were defined as crime, immigration and national defense and how these issues should affect the budget and the issue of tax cuts and simplification. It was obvious that this meeting with the media had been planned for addressing economic priorities and that the President knew and was well prepared to make hay out of the Democrat leadership refusal to join him just to be harangued over their positions. Sometimes a small shame is preferable to a drawn out spectacle, and the President is long on spectacle and thus far short on production. This has mostly to do with two simple facts, one blaming the Democrat Party and the other the Republican Party. We will return to the budget, taxes and the divided Congress and nation, but first a short trip to the United Nations where the Security Council held an emergency meeting on North Korea and their Ballistic Missile Launch. Below is a video about said meeting with commentary from United States Ambassador to the United Nations Nikki Haley as well as the Ambassadors from Japan, Great Britain, China, Russia and South Korea. The approximately one hour meeting spent much time on the seriousness of the breaking of the United Nations placed limitations on North Korea. The Breaking of this treaty is a serious and threatening action which requires the United Nations to take steps. The estimate was given that if flown on a standard trajectory it would have a range in excess of 13000 kilometers. The polar circumference of the globe is 39,931 kilometers which means that this North Korean ICBM could readily strike anywhere over around two-thirds of the planet with Africa and South America being the only continents not mostly within range and leaving the southern most parts of Australia beyond the missile range. This missile is the game changer which President Trump had set as one of the parameters of the North Korean capabilities which would force the United States to act. The other items included miniaturized warhead capability and reentry-hardened capability, both of which may already have been realized. The problem is without an actual successful deployment of a nuclear weapon on an ICBM, hopefully into an empty part of the oceans and after warnings with adequate time for ships exiting the effected area, there is no means of actually verifying these last two items. The meeting was as much of a punch-down on the Democrats and list of their opposing attitudes for the future of the United States. The fact is that the Democrat Party members in Congress, both the House and Senate, will vote almost exclusively as a single entity opposing everything and anything which President Trump or the Republicans attempt to pass as legislation. The President also took a jab at the media for their misreporting on his words parsing his words looking for any single misstep to flaunt before the people. The recent Senate passage of tax reform legislation was a perfect display of both problems faced by President Trump and the shortfall of the Republican leadership in and outside of Congress. The tax cuts were passed without a single Democrat voting in favor, not a single Democrat Senator voting favorably. This has become the expected voting by the Democrats where their leadership has taken an extreme position of complete and total opposition. The sole example of the Republican opposition of President Obama and his legislation was against Obamacare, otherwise the Republicans were permitted to vote their conscience and representing the desires and needs of their constituents. Not so from the Democrat Party which has decided that everything passed which was not of their drafting will be opposed totally and completely until the Republicans realize the error of their ways as the majority party and allow the Democrats, who are in the minority and do not hold the White House, to write and pass into law everything according to their demands and ideas. Very simply stated, the Democrats have decided that only their party may lead the country and they will oppose everything not of their authorship. That is more dysfunction than principled stance. A principled stance would permit those in the party who felt that something written by the other party was worthy, could support that legislation. That is no longer permitted by the Democrat Party and any Democrat voting for any legislation will not be permitted funds from the central party and may face party sponsored opposition in the primaries. That is not the actions of a functional party, that is the attempt of the few to assume all-powerful positions given even the slightest opportunity. The other side of the coin has exactly the opposite problem, as there are a group of Republicans, specifically in the Senate, who willingly oppose the Party leadership and especially the President and his proposals by refusing to pass necessary legislation. Even this tax legislation was held up by the ‘Never Trumpsters’ until they were permitted to weaken some parts and add their own pet propositions which were not desired by the President as his aim was to simplify the tax code and this small set of demands accomplished the opposite. These are the same Republicans who while guaranteed their legislation to repeal Obamacare was guaranteed under President Obama passed legislation calling for exactly that over one hundred times yet now that such legislation would be received with great enthusiasm by President Trump, this small group of anti-Trump Republicans who believe that only political functionaries such as themselves should be permitted to seek the White House, have refused to try and repeal Obamacare now. These few recalcitrant Republican Senators, which include a former losing Presidential candidate, believe their positions are more popular than those upon which the President of the United States campaigned. These problematic Republicans could guarantee that President Trump would be reelected simply passing two or three of the Presidential programs, tax reform, border wall and stronger immigration vetting, to make the Presidential 2020 campaign one based on accomplishments. They appear to prefer he fail and the Democrats gain control. This may be because they find it easier to oppose from the minority than act as a majority and take responsibility for the country and the needs of the people. So the two problems the nation is facing are the complete opposition by the Democrats and the lack of unity in the Republicans. There will always be those who side with the other side and others who insist on the limelight not capable of sharing center stage. If they only would realize that they are but the clown left to entertain before the adults take the stage, perhaps they would act responsibly for a change. The odds are that numerous Representatives and Senators are the meat of the problem when it comes to the graft, malaise, inaction and unresponsiveness which have become the largest problem facing President Trump and the American People. This is driving voter dissatisfaction with numerous Representatives and Senators who will face rough battles in trying to keep their seats at their next run for office. The problem is that these two groups are largely separate and have only the smallest of overlaps (see diagram below). This means that the greater number of members of Congress vulnerable to change from voter actions is not part of the problem and the problem stems largely from those members of Congress who hold seats which from gerrymandering or simple numbers are safe from the voters, as they will be reelected short of anything except intervention from the Almighty. This has been the truth for the longest time as the two parties have operated in such a manner as to all but cement the members of Congress in their respective seats almost permanently. This was because once these parties had control over a state during an election year or census year, they fixed the boundaries for Representatives such that their party would win the most seats and the opposition party would win the fewest seats possible. Even with this working against change, change does occur once the populace is united for change. Right now, the populace is not at all united and is as far apart as possible. The desire for change is largely with one party which makes things worse, that means those elected by the party desiring change are most vulnerable. The depth of the problem gets even deeper as the members of Congress are masters at deceiving the public on their record. When the Congress faces a piece of vital legislation that the people back home desire and the big moneyed interests want quashed, there is a means by which every member of Congress can claim they voted for the legislation while actually voting to kill the measure. Each bill will come up for a vote many times before it might pass or be voted down. As each preliminary vote arrives, the opening comes for many members to vote in favor at one of these junctures and still vote against the legislation on the final vote, thus killing the legislation. Once before the voters they can claim to have supported the legislation and voted for it at one of the most crucial votes that it faced and these statements are valid though misleading. Now this Congresscritter will garner the support they need both from the big money interests and from the involved public voters as they gave both sides their desired result. For the voters they honestly told of voting for the legislation even having the rollcall vote result with your vote in favor while you voted against the legislation in the only vote that counted, the final vote for pass or fail on the legislation. Isn’t elective office fun? You can vote for and against every piece of legislation and when the time comes for reelection, you can put your finger into the wind, determine the direction, and tailor your record to match the will of the majority. The above demonstration explains how people like Senator John McCain get elected claiming their full support for every measure for replacing Obamacare and then at the most critical juncture, be the point man leading the Republican “Never Trump”ers in their six Senator vote against replacing Obamacare leaving it entirely intact. You need understand that Senator McCain told his voters about how he had supported every single one of the fifty, sixty, some places claim hundreds of times that the Congress over the last six years that President Obama was President and Congress was with a Republican majority in both houses. There was a secret which Senator McCain was not telling his constituents. Senator McCain was beholden to some very wealthy people and their corporations, specifically pharmaceuticals and health insurers, as well as he is really a “Big Government” stalwart. Thus, he supports government healthcare whether it is Obamacare or the only thing better, single payer government healthcare system like in Canada and Europe. When these bills to repeal Obamacare came which he supported, he did so confident that President Obama would veto them and they were not able to overrule his veto with the required two-thirds vote of each House of Congress. This made his support nonthreatening to his wealthy and interested parties who he assured that the President would protect his healthcare system and he would not allow it to be replaced by anything other than full government run healthcare. 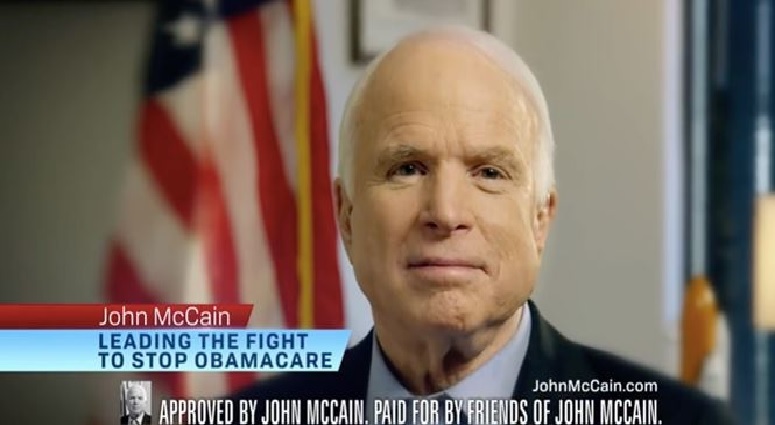 His reelection campaign was centered on his voting consistently when it did not matter to repeal Obamacare and how he was guaranteed to continue his opposition to Obamacare as it stands (see McCain Reelection Poster below). This, too, is truthful. Senator McCain would vote immediately to repeal and replace Obamacare with a single payer government run healthcare bill such that Senator Sanders Medicare for All legislation would be the perfect fit. Such was the perfidy applied to the campaign for his reelection to the United States Senate where he now leads the “Never Trump” contingent of the Republican Party which is assuring that President Trump fails to fulfill a single campaign promise thus all but assuring he will lose any bid for serving a second term in the White House. These Republican “Never Trump” stalwarts are guaranteeing the election of a Democrat in the next Presidential elections in 2020 and most likely with a willing Congress led by these same Republicans. The above are a perfect example about which we are speaking. Senator McCain is all but impossible to defeat in Arizona. In his most recent election, he won with 53.7% of the votes. Something becomes evident if we are to track Senator McCain and his vote record on previous election results as in his first election to the Senate in 1986 he won with 60.48% of the vote, in 1992 in a five person race he took 55.82% of the vote, in 1998 and a four person race he won with 68.75% of the vote, in 2004 in a three person race he took 76.74% of the vote, in 2010 with another four person race he won with 59.29% of the vote, and in the recent 2016 in a three person race he garnered 53.70% of the vote. Looking at the last three elections it appears as the percentages drop from 76.74% through 59.29% down to a slim 53.70% that John McCain has been fooling less and less of the populace as this drop is far greater than the changing demographics. By our reasoning, and knowing Senator McCain’s general health with a debilitating cancer of the brain, this will very probably be his last term if he should survive and finish even the coming six years. We wish Senator McCain to find a miracle which cures his disease and renders him full health but at the same time, considering his recent rantings about not supporting any legislation unless it is supported by a bipartisan group knowing that the Democrat Party has already made it clear they will vote as one against every proposal by President Trump and the Republicans. Quoting from the New Yorker Magazine, “When McCain returned to Washington for the first time after his diagnosis of brain cancer, he gave a speech on the Senate floor that called for bipartisan health-reform legislation that was the product of so-called regular order, where legislation goes through a transparent committee process and both parties are able to shape it.” From the same article quoting Senator Schumer who applauded Senator McCain for his stance claiming that he influenced Senator McCain stating, “I have assured Senator McCain that as soon as repeal is off the table, we Democrats are intent on resuming the bipartisan process.” That helps, if you promise not to repeal, which also removes replace, then we will work on how to throw more funds at Obamacare until it works, yea, that will help, NOT! This will be the problem going forward as the Democrats in the Congress, at least in the Senate, have given their word to their leaders that they will vote as a group against every proposal from President Trump unless they are told they may do otherwise on a case-by-case basis. With Senator John McCain leading six recalcitrant Republicans who have promised to vote with the Democrats, President Trump is facing a deadlocked Senate which will reject everything he attempts to do unless he bows before the Senate Democrats and grants them veto control over his proposals. Lack of Republican vote discipline in the face of total vote discipline by the Democrats places everything which President Trump proposes on a fast track into the trash. Yes, the Republicans voted 100% against Obamacare and it passed on total Democrat support. That was the sole time the Republicans voted in such a manner. The Democrats have voted as a block against every Republican President since Reagan if not Nixon. The Democrat Party has a simple rule, if they are not making every decision, then nothing gets done if they can prevent such. Meanwhile you have McCain and friends siding with this Democrat Party undemocratic approach that they get final say on all legislation. Yet the Senators and Representatives who will mostly pay for this recalcitrant behavior are probably the Republicans who are working to try and pass repeal and replace Obamacare, tax cuts, border security and the other Republican and Trump proposed legislation. That is because a few of them fall into the red zone and deserve such but the vast majority is in the green area and are supportive of the President and Republican proposals. The odds favor the Republicans losing the Senate simply because their base is angry with John McCain and his five followers and this can cost the Republicans Senatorial seats and they only have a two-seat advantage now. It is the slight majority which allows the likes of Susan Collins of Maine and Lisa Murkowski of Alaska joining with John McCain which ends any hopes of passing the President’s proposals to the Congress. 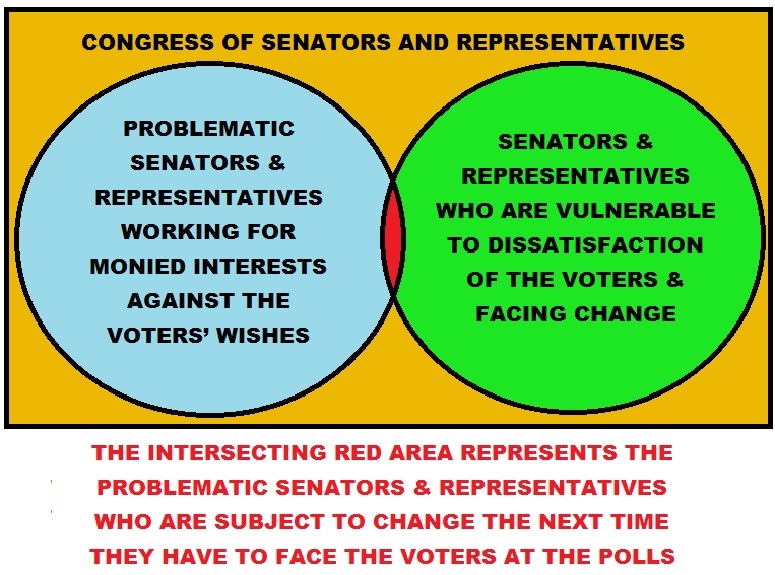 Unfortunately, the majority of the opposition falls in the light blue region of the diagram given earlier in the article with some decent safe seat Senators who vote for their constituents first and foremost, and they are unfortunately not the majority. That is why in the coming election the votes for change in Congress will have little if any effect on the final outcome of votes in Congress. Those supporting more government will continue to control the vote and the people will not be decently represented, as most Americans would like the government to govern responsibly and not just throw money at problems with no oversight or guidance, which dooms the programs to failure. Republicans have a unique opportunity if they are willing to take it. This is something which does not come around very often. As a matter of fact, this opportunity is so rare that most people live their entire lifetimes and never get such a present. The Republican Party itself was born out of just such a time as these. It was before the Civil War and the big issue of the day was slavery and whether it was an ethical practice or needed to be ended for humanitarian, social, ethical and moral reasons. The two parties were being torn apart by this very issue though they mostly stood on opposing sides. The complete history of the major parties of the United States throughout its history is chronicled at government and constitution.org and was used as reference for this article. 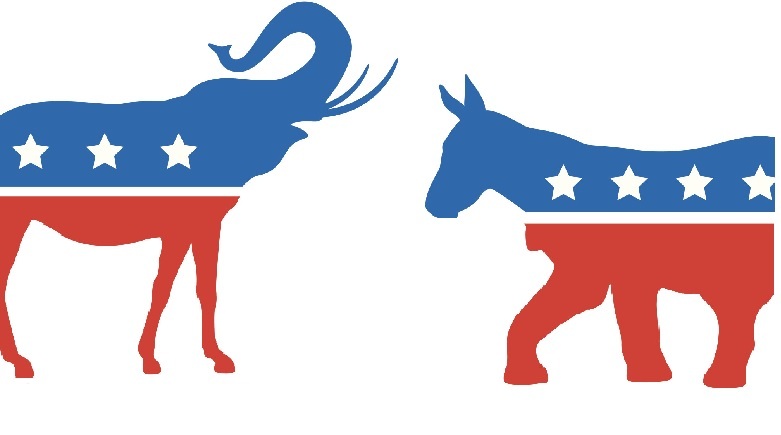 The Democrat-Republican Party between 1825 through 1829 dropped the Republican title and became today’s Democrat Party. The National Republicans in 1832 became the Whig Party. It was not long before the Whig Party had some serious difficulties over the slavery issue and had major subgroups within split to become the Free Soil Party and this brought both parties to difficulty as neither had sufficient unity of followers to defeat the Democrats. In 1854, the remnants of the Whigs and the Free Soil Party rejoined becoming the National Union Party. The National Union Party won the Presidency in 1860 with Abraham Lincoln. Upon Abraham Lincoln’s assassination, Andrew Jackson was sworn in as President and renamed the party the Republican Party and this was the actual birth of the Republican Party. With each change of name, the leadership of the parties had gone through changes and the citizens who joined had the ability to determine the basic ideology for the party going forward. The Republican Party was born on the slavery issue determined to end slavery while the Democrat Party tried to preserve slavery as the states in the south where the Democrat Party strength resided was dependent upon the slave labor to run their plantations, or at least the moneyed interest who ran the party supported slavery. So, on the initial slavery issue, the Democrats were supportive of the slave owners and the Republicans supported the freeing of the slaves and ending slavery in the United States. Perhaps now we can jump forward a few years to the Civil Rights Act of 1964 and its passage in the Congress. Common knowledge which is portrayed by the mainstream media and in election material is that they passed on Democrat votes and the Republican Party was in opposition. That is not entirely true and in reality contains shreds of misinformation. So, allow us to portray the actual votes as recorded by Wikipedia. The original House version was passed by a vote of 290 in favor and 130 opposed which is a 69% in support and 31% opposed. There was a filibuster in the Senate requiring a cloture vote in the Senate which succeeded with 71 in favor and 29 opposed needing merely sixty votes to succeed. The Senate then voted on their version with an even more impressive 73 in favor and 27 opposed which was a 73% in favor and 27% opposed. The House then voted on the returned Senate version voting 289 in favor with 126 opposed which yields a 70% to 30% favorable vote. Now for a by party breakdown which is where it gets interesting. The original House version garnered a Democrat Party of 152 in favor with 96 opposed yielding a 61% to 39% favorable margin. The Republican Party also passed the act voting 138 in favor with 34 opposed yielding an 80% to 20% favorable margin. Cloture in the Senate had the Democrat Party vote of 44 in favor and 23 opposed yielding a 66% to 34% favorable vote and the Republican Party vote of 27 in favor and 6 opposed yielding a 82% to 18% favorable vote. The final vote in the Senate on their version was Democrat Party voting 46 in favor and 21 opposed yielding a 69% to 31% favorable vote with the Republican Party voting 27 in favor and 6 opposed yielding an 82% to 18% favorable vote. The House vote on the Senate version was Democrat Party voting 153 in favor to 91 opposed yielding a 63% to 37% favorable vote with the Republican Party voting 136 in favor to 35 opposed yielding 80% to 20% favorable vote. The reality of the Civil Rights Act of 1964 vote was that it was an overwhelming passage by both parties. Further investigation is another development. This reveals that the Democrat Party vote passing with respectively 61% and 63% House favorable votes and 66% and 69% Senate favorable votes with the Republican Party 80% and again 80% House favorable votes and 82% and again 82% Senate favorable votes. The reality is that the Republican Party had a higher favorable percentage in every vote compared to the Democrat Party which is slightly different than what is often portrayed. The next year voting on the Voting Rights Act of 1965 was as follows. The Senate vote went Democrat Party voted 47 in favor, 16 opposed and 4 did not vote yielding a 75% in favor while the Republican Party voted 30 in favor with 2 opposed yielding a 94% in favor. In the House of Representatives, the Democrat Party voted 221 in favor, 62 opposed and 10 not voting yielding 78% in favor and the Republican Party voted 112 in favor, 23 opposed and 5 not voting yielding 83% in favor. Once again, the bill passed with overwhelming support but once again the Republican Party voted 94% Senate favorable and 83% House favorable while the Democrat voted 75% favorable Senate and 78% House favorable making the Republicans once again voting in higher percentages than the Democrats, the opposite of what the media and common knowledge have evolved to. Since the Civil War, the Democrats made quite a change and the Republicans remained on the side of equality. It does make one proud that both of the parties are supporting equality these days. Now to the opportunity the Republicans have and the Democrats really could use, the ability to alter the policies of their party remaking it more to their desires. The less fortunate Democrats appear stranded watching their part move leftward to the point of absurdity with a good number signing on to support Senator Sanders Medicare for All plans and desiring that a support abortion on demand as a litmus test for candidates to receive any central party funding. Meanwhile the Republican electorate is facing a wonderfully delicious selection between the Senator McCain branch and the Trump wild party or maybe the Mitt Romney wing as Mitt’s niece Ronna Romney McDaniel serves as the Chair of the Republican National Committee or there is the Bush dynasty who still has Jeb sitting in their bullpen. The thing is that the great choices will come fast as 2018 is approaching and with a number of the squishy left-leaning Republicans announcing their intentions to retire, there are some wide-open seats where fresh blood can be elected. Then there is the Steve Bannon wing of the party which is wide open to anyone who has never held political office and can prove their conservative credentials or at least promise to listen to Mr. Bannon when needing advice and on how to vote, though probably proving to be a true conservative and able to decide for yourself might be a wiser path. What would be a good start in the path to remaking the Republican Party might be to try something not done in a very long time, choose candidates who actually have never held office but make an impression and who the community know and who will stand up for the people and their interests and not the lobbyists or corporate interests. It might also be nice to elect people who will actually do as they campaigned and not talk the talk but find walking the walk just too difficult to actually bother to try. The fact that the Republican candidates campaigned for seven years on repealing Obamacare and voted near countless times to repeal Obamacare while President Obama was there to veto their bills thus protecting them from actually standing for something but apparently were not all that serious as they became incapable of doing it one last time once they had a President who was waiting to sign their repeal of Obamacare. Perhaps that might be their first task after the election and any who fail that test can be replaced in 2020 and then again in 2022 until the people have the Republican Party they desire, or should we say deserve. Some claim they have what they deserve now referring to President Trump, and those who agree that Trump is making an interesting President and actually standing for policies that are truly conservative. That would make a good start. But we will have to see what candidates present themselves in the primary elections. Perhaps some amateurs, real, normal people will step up and risk the trials and tribulations of running for public office and all the examinations, inquiries and other invasions it will take. Be advised that the task is monumental and it is of great assistance to have a reputation at your house of worship and perhaps some community service clubs and other reputable institutions in the community to assist with the efforts and provide a base from which to launch a campaign. Take that as words and suggestions from those of us who have been there.